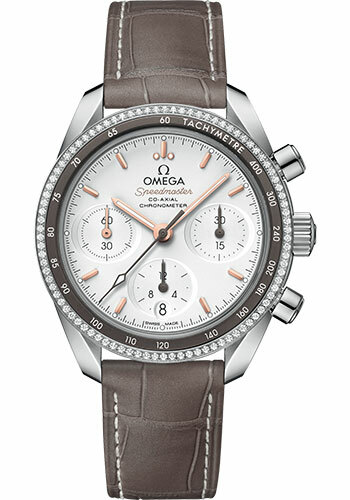 38 mm stainless steel case, dual bezel with a tachymeter scale on a grey aluminium ring while the outside is diamond-paved, scratch-resistant sapphire crystal anti-reflective treatment on both sides, opaline silvery dial includes horizontal oval subdials and a vertical oval date window at 6 o’clock, tachymeter scale, Caliber Omega 3330 self winding movement with chronograph, chronometer, date, approximately 52 hours of power reserve, taupe-brown leather strap. Water resistant to 10 bar (100 metres / 330 feet). 38 mm stainless steel case, dual bezel with a tachymeter scale on a blue aluminium ring while the outside is diamond-paved, scratch-resistant sapphire crystal anti-reflective treatment on both sides, sun-brushed ice blue dial includes horizontal oval subdials and a vertical oval date window at 6 o’clock, tachymeter scale, Caliber Omega 3330 self winding movement with chronograph, chronometer, date, approximately 52 hours of power reserve, blue leather strap. Water resistant to 10 bar (100 metres / 330 feet). 38 mm stainless steel case, dual bezel with diamonds on the outer section and tachymeter scale on the black aluminum inner ring, scratch-resistant sapphire crystal with anti-reflective treatment on both sides, sun brushed grey dial, caliber 3330 self-winding movement with chronograph function and a small seconds subdial at 3, 6 and 9 o'clock, approximately 52 hours of power reserve, grey leather strap. Water resistant to 100 m (330 ft). 38 mm stainless steel case, dual bezel with a tachymeter scale on a white ceramic ring while the outside is diamond-paved, scratch-resistant sapphire crystal anti-reflective treatment on both sides, white mother-of-pearl dial includes horizontal oval subdials which are diamond-trimmed and a vertical oval date window at 6 o’clock, tachymeter scale, Caliber Omega 3330 self winding movement with chronograph, chronometer, date, approximately 52 hours of power reserve, white leather strap. Water resistant to 10 bar (100 metres / 330 feet).